I am looking for the Fisher Price Puffalump Kid – Greg- blue Puffalump boy body with a vinyl face- FP #4096 1991-92. My soon to be 2 year old granddaughter is waiting on twin boy and girl siblings, and I want to give her the boy(Greg) and a girl (already have Heidi, Sherri, Merri and Whitney) either for her 2nd birthday, October 31…. when the twins are born, November-December, or for Christmas at the latest. 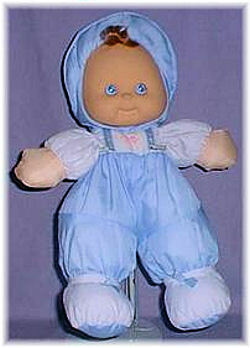 If you can help Valerie find this Greg Blue Puffalump Boy Doll, THIS SITE IS NO LONGER ACTIVELY MANAGED. Please use Our FREE FACEBOOK GROUP, including #092008-7 in the subject, .